↑ Thorington, R.W., Jr.; Hoffmann, R.S. (2005). 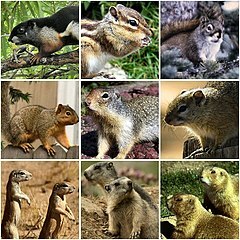 "Family Sciuridae". In Wilson, D.E. ; Reeder, D.M. Mammal Species of the World: a taxonomic and geographic reference (3rd ed.). The Johns Hopkins University Press. pp. 754–818. ISBN 0-8018-8221-4. OCLC 26158608.